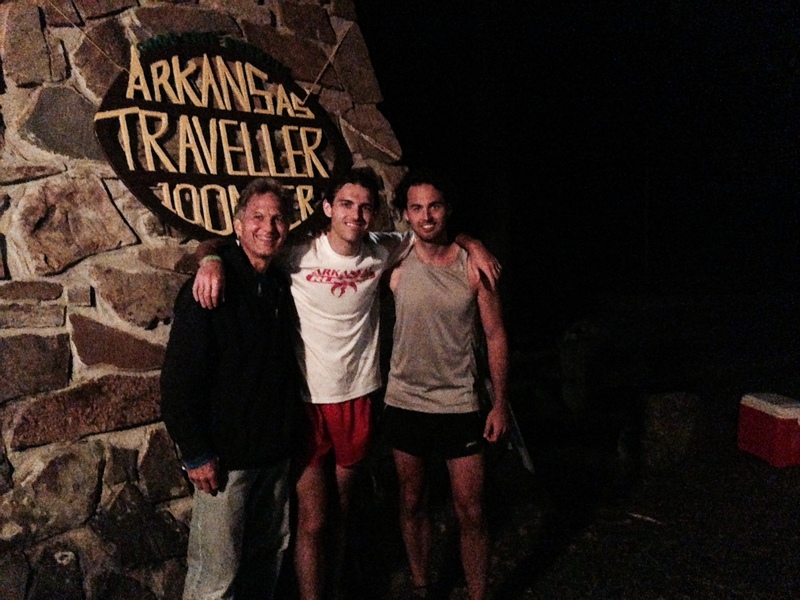 Crewed for Wesley in the Arkansas Traveller 100, which he won with a time of 15 hours, 59 minutes (third fastest time in the 24-year history of the race, and 22 minutes off the course record). I met him at five aid stations along the course (miles 16.1, 31.9, 48, 67.9, and 83.9; our Dad was at the last three), and we had him re-fueled and out of each station in less than two minutes, sometimes much less. At the last crew station (mile 83.9), I paced Wesley through the dark to the finish line. Really fun running through the pitch-black Ouachita National Forest with nothing but headlamps. My only concern was keeping up with Wesley during the last 16.1 miles; he ran mile 100 (mile 16 for me) in just under seven minutes. Dad, Wesley, and I after the race on Saturday night.